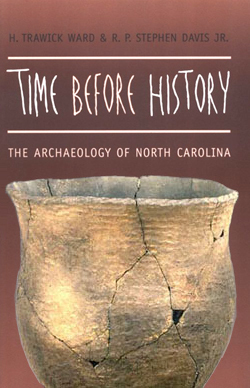 This website leans heavily on Time Before History, an authoritative summary of the archaeology of North Carolina. Published in 1999 by the University of North Carolina Press, presents a narrative of the state's archaeological history across the broad sweep of time, from the Paleo-Indian period through the arrival of European traders and settlers in the sixteenth and seventeenth centuries. This on-line guide to the archaeology of North Carolina has been designed to outline the basic structural information from Time Before History along with enhanced images as supplemental information. It does not replace the detailed accounting and supporting references of the published version but gives thumbnail sketchs of the archaeology and artifacts that tell the ancient history of our state and provides the states' archaeologists anchor points from which to post more detailed information and deeper access to collections and new discoveries. You may navigate this website by either archaeological period or region. We recommend these other web-based sources of information on the archaeology of North Carolina. About the authors: The late H. Trawick Ward was a research archaeologist at the University of North Carolina at Chapel Hill. R. P. Stephen Davis, Jr. is a research archaeologist at the UNC-CH Research Labs of Archaeology. The development of this website was funded by a grant from the Alcoa Foundation and by the Jeanne B Weihrer Fund for Archaeology at the University of North Carolina at Chapel Hill.